Many of you know, cause I have mentioned before, that my oldest has become a hospice nurse. She is doing a job that I knew would be emotionally draining for her. I worry about this. She is young and that is a lot to deal with on a regular daily basis. But what I did not anticipate, was how much her job would impact me and my husband and even my other older kids. My girl had to work on Thanksgiving and managed to eat with us but was called out to death that evening. I just kept feeling these pangs of how we were celebrating a lovely holiday and that poor family was saying goodbye to a loved one. Well, yesterday we had a nice gathering for my husband's birthday. Friends and family all here and a delicious dinner with cake and presents. The usual things. But I have to say, my daughter working for hospice is teaching me the real value of life, the everyday, the wealth and blessings around me. This year I have been really enjoying all the holiday preparations like I never had before. After everyone abandoned me while decorating the tree the other day, I had a realization of myself just smiling and singing along to the carols on the radio. I just felt so happy to have Christmas here and not the twinge of panic or exhaustion I might have in previous years. So much to do and get done. Who cares. Just a sense that I was truly happy and enjoying all the busyness of the season. Christmas has always been my favorite time of year but this year I have felt so much joy. I did not put two and two together until last night. 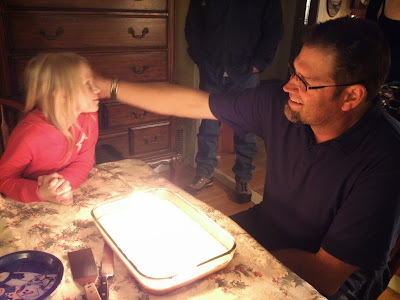 My dear girl could not make it to her daddy's birthday because she was on call and had a very stressful day of call outs and in the evening a text came that she would not make it. She had to attend an active death. Her and I always send texts back and forth when she is out. Just occasional ones to encourage her and to make sure she is okay. I'm her mom, I worry right? Last night a woman was dying at a facility so I received texts updating me when she had time while waiting. "She's struggling to breathe now." "It's so sad mom." How does your heart just not burst for your girl for that woman, for that family? I share on and off with our guests here for the birthday. This grounds you. I mean we were so enjoying each other's company. How precious this all is. Life, family, friends. Well, after we went to bed I was awoken by my dear girl letting me know at 12:45 am she was home safe. Thank God. I can sleep soundly now. But then a stream of texts, "Mom it was so sad." "She died alone." No one was there. No one called. "Mom, I cried for her." I asked if she was alone with her? "No, the owner of the board and care was there too." That's it. I know she needs to vent, to release a little after these kind of events. But that was it for me. I just wept. I wept for my daughter having such a hard job. Wondering how this will affect her. I wept just cause I am a crier and I was sad thinking of my folks and how we all were around them as they passed and how thankful I am for my family and loved ones. But mostly I wept for this poor lady. After an entire life how does one have no one to be there, no one to call when leave this earth? It just isn't right. Too many answers I know to that question. I have no idea why God has lead my daughter in the direction she has gone. Words cannot express how proud but how amazing her dad and I think she is. I truly would not be able to do that job. I would be a wreck but we wonder how she is so strong. But I will simply take from this time in her life a bigger, deeper realization of the sweetness of life. I will savor this Christmas I think like no other. And dear lady who passed away last night, I do not even know your name but you did not die alone, my girl was there for you and she wept for you and I have wept for you. God speed. How courageous of your daughter to take on this career-and thankfully, that because of her, that poor lady did not really die alone but with a caring person by her side. Thanks for sharing this. I've been following your blog for a while now... long enough that I don't even remember how I found it to begin with. I'm not sure if I've ever commented or not, but this entry... Well, I just had to say something. My father passed a little over a year ago and was on hospice care. Those nurses were such a blessing to us during the hardest time we'd ever gone through. I have wondered about how those lovely women came to be in that line of work and how it affected them. Give your girl an extra hug when you see her and let her know that her work means the absolute world to the families. Christina thank you and I will. Jennifer my first encounter with hospice was 11 years ago as they helped us with both of my folks who died a couple months apart. Like you I could not say enough about how wonderful they were. We are lucky to have a system like this where they teach such respect for end of life. I will tell her what you said. Elaine, I write this with tears in my eyes. Our family is well acquainted with the work that hospice does. I lost my sister in her early 40's to cancer, she died at home with her family and the hospice nurse with her. My grandmother also died at home surrounded by family and with hospice care and Earl's aunt passed this year in a hospice facility in the middle of the night. I cannot express how grateful our family has been for the work that hospice does to make that transition as pain free for the patient as possible. I have been astounded by the compassion and love each of these nurses have shown to our loved ones and I have thanked God for these angels of mercy many times. Your daughter must be a very special person to have chosen this field. It does not surprise me, you show so much love for family, joy and compassion in your writing, your children have an awesome example of love. Please thank your daughter for me, for the work she does, and I will keep her in my prayers that God would help her in her work and comfort her in the hard things she has chosen to do. In tears as I read. Your daughter sounds like she chose the right area of nursing. My husband's father and my father both died on Thanksgiving (many years ago). My husband's mother died on Christmas. I told my mother she couldn't do that to us. She died in summer for us instead. But, in each case, they died surrounded by family. I am happy that God placed your daughter by the woman's side. Elaine, I follow you and have been for quite a while even though I very seldom comment. I read this with tears streaming down my cheeks. Life is so precious, isn't it? And we have so much to be thankful for. Your daughter is doing such a wonderful thing and I know you worry about her as I would and do my daughter. Hospice is a wonderful organization and they were there when my father passed away 18 years ago. I'm saying a prayer now for the dear lady that passed away alone, and for your dear daughter. May she be richly blessed. Tears in my eyes and a lump in my throat. Your daughter has been called to a wonderful ministry...to be there for the dying. You are righ to be so proud of her and her compassion and love. Praying for her to have continued strength and for the lady that did not die alone, you sweet girl was there with her! You have raised an amazing child, with a gift that gives to others without question. And now I am crying, too. Thank God for hospice nurses like your daughter. One was there for us when my Mom died 8 years ago, and another one was there for us when my uncle died last year (he never married, but I stayed by his side). Hospice meant all the world to me, and I can't praise these precious nurses enough. Give your daughter my love and thanks. Beautiful post ... and you have a beautiful daughter. My husband and I were with our oldest son when he died this past June and it is a precious, though terribly sad, experience. My daughter is also a hospice nurse, and I have been in the nursing/ nurse practitioner field for 45 years. It is a calling, and over time, she will see more.. the good that comes from this than the pain. death is a part of life, and many good things happen during this time that hospice can facilitate. Families making stronger bonds, saying goodbye in "good ways' rather than just feeling helpless. Blessings to your daughter. What a powerful post! It was touching, sad, beautiful and put a knot in my stomach. I have no idea how people can do that job but I'm very appreciative that they can. I've often wondered how Hospice people can do it, how it affects them, how long they can deal with it. I never thought about the affect it might have on their family and friends. It's a sad, hard and wonderfully beautiful thing all the way around. How sad that some people die with no loved ones around. I just don't understand. That's such a wonderful thing that your daughter was able to do...to be there for that lady's last moments on earth. Wow! Hugs to your daughter! Have a beautiful holiday! Oh Elaine, tears. How brave your daughter is. But then, I've always known you're about the best mother in the world. I want you to tell her this: In 2006, when my dear older friend was dying at home, I drove the many hours to be with her. I was not related, except earlier in my life, by marriage. Her family stayed in the kitchen and ate and chatted. I was the only one with her when she died. But what I want you to say to her is this: Those two hospice nurses allowed me to get up in the bed and hold her while she died. Because I could not bear for her to be alone. I whispered the most important things: I love you. You have been the best grandmother to my girls. I wish you'd been my mother. And those wonderful hospice nurses stood by respectfully. I was so thankful to them. If I had not been there, I guess she would have taken her last breath and no one but the hospice nurses would have heard. They are an important, VERY important, part of the death process when one leaves this earth. Oh, and please hug her for me. Bawling sweet friend, just bawling. No need to wonder how she does it...simply look in the mirror. You have provided her with the backbone and compassion. She has been courageous enough to follow her heart. She will be in my prayers. OMGosh, does this hit home. God bless your daughter and all of the other folks who do hospice care. My momma is now under hospice care and I live too far away to be with her. I'm so grateful for my siblings who are close by and for the nurses who are able to attend to her needs. So grateful that your daughter was there for this lady. I too, wonder why she had no one? Thankful for the lessons and for your insight at this time in my life. What a poignant post, Elaine. Your daughter is certainly one to be proud of. Losing a loved one is tough, but the burden is lessened by people like your daughter. It's such a blessing to the families who are suffering, to know that their loved one is in such loving and caring hands. Gosh, this is so tough. Bless your daughter for being able to do the job even though it's incredibly hard. It is beyond sad that the woman didn't have anyone with her, but I hope she knew your daughter cared and was there for her in her final moments. I think your daughter appreciates and counts on your text messages more than you know. I am so moved by reading this post. Your daughter is one of the special ones....I've had occasion to use Hospice three times and found that they were so caring and kind....not just for the patient but the whole family. My son, mother, and husband had the best of care at the end of their lives. So glad we called on Hospice.I think that there's a special place in Heaven for Hospice workers. Your daughter sounds absolutely amazing, you have clearly done a wonderful job as parents. I am so thankful that people like her are out there when needed. So sad about the lady who died, but at least she had your daughter there, in that she was blessed. She died with your sweet daughter, a well prepared nurse there. I would argue she was not alone. Your daughter is doing a wonderful and needed job. Bless her! Such a lovely and heart felt post. Your daughter is doing an admirable job - one I doubt I could do. And you are right - that woman did not die alone. My sister worked for Hospice for 20 years. It changed her greatly. This was one of the most beautiful posts I have ever read.....thank you...and I am also going to enjoy this Christmas a bit more because of you! What a beautiful and touching post! We've had hospice several times - even tho all the family were still there. But when our dear little Landen passed away, the hospice male nurse was there and provided so much comfort to our pain! They know exactly what to do and when and are just amazing. God bless your daughter for choosing one of the most emotional jobs in the world. But, oh the rewards of being there for the patient and their family. Bless you all for giving her the compassion and love you raised her with. "we are blessed to be a blessing" that came to mind reading this beautiful post. Your daughter has been blessed with you and hubby as her parents and she is now a blessing to others. Indeed, that dear lady did not pass on to the next life alone. Having known you personally for a couple years now, I know you well enough to know that your children are a reflection of you and your husband. Your daughter has chosen to work in an area that is not suited for everyone. That is why they are so special. My experience with hospice with my Dad, and recently with Nana, has been nothing short of amazing. These men and women are called to this. You are so right to be there emotionally for her, as it is still very difficult. But too, a natural part of life. Some people, like my Dad, would not let go with all of us there. Nana too. Sometimes the family is encouraged to go, so that they can leave their earthly world, and move on. You have written such a touching post today. And, you are so right. The big matters of this world are family, life, love, and we are so fortunate to have that. Elaine, this is such a beautiful post. There truly is no bigger blessing than love, family and friends. I do believe when you have witnessed or experienced a great loss, it turns the "little things" into the most important things in life. Your daughter has chosen a calling that not everyone could handle, God bless her. We have met the most incredible people through Hospice. Please give your sweet girl a big hug from this Mama who is so grateful for the love and respect shown to my son while he was in the care of Hospice. I believe your daughter is a reflection of the parents who raised her, be very proud! This gave me a lump in my throat. I read your post this morning and it made me cry. I thought about it all day. That is one special daughter you have. Such a moving post, Elaine. We're all a breath away from death and yet we often take our life so for granted. May God bless and strengthen your daughter who has made a noble choice in how she chooses to live her life, by waiting with those whose lives are ending. Oh my gosh, Elaine, this is such a beautiful post. I don't know how your daughter does it either, but she is obviously a very compassionate person. I wonder if she will continue this for many years, or if it will become too much for her and she will change directions? I guess only time will tell. Good thing she has the loving support of her mom and dad. Blessings to you all. We had a nurse help us when my grandpa died. It was so very good to have her with us. I'm behind in catching up with my blogger buddies!! Just read your last post and had to come down and post on this one. It takes a very special person to do what your daughter does. My Dad had brain cancer and after fighting a hard and difficult battle- he had to be placed in the Hadlow Center in Jax.Fla., because he was too large of a man to care for by my Mom. this is where he spent the last 6 weeks of his life - surrounded by love of family and the care of the staff. Basically the fact is - We're ALL a day closer to our passings. The respect and dignity was astounding. My Mother would spend the day with Dad and either I or my sister would fly in and spend the weekend night sleeping on a cot next to Dad. He was alert and knowledgeable of what was happening up to the last 4 days when he drifted into a coma. We continued to talk to him and play music for him. We played harp music for him and if it wasn't playing in the background- he requested it. We laughed, we talked, we cried, we joked, we were able to say our goodbyes. I spent 6 weeks with ANGELS who attended to every need of my Father. I hope your daughter will remain strong. I do not feel sorry for your lady --- she had your daughter there to help her to cross over. Let your daughter know that it's her faith that will make her strong in knowing that THERE IS A LIFE HERE AFTER!! Having faith in God and knowing that she is preparing each person to be in a better place is amazing and wonderful!! You grieve for those living who do not believe in God. I don't know how one who does not have a faith can live day to day. God Bless your Daughter!! You must be so very proud! !